Podcasting is on fire, with listenership soaring, and the number of podcasts multiplying like Tribbles, including our own podcast proliferation here at Convince & Convert Media. But even with all that growth, podcasting is still a niche media type seemingly destined to be a tertiary way to get entertained or informed. But maybe, just maybe, Blab will change that? 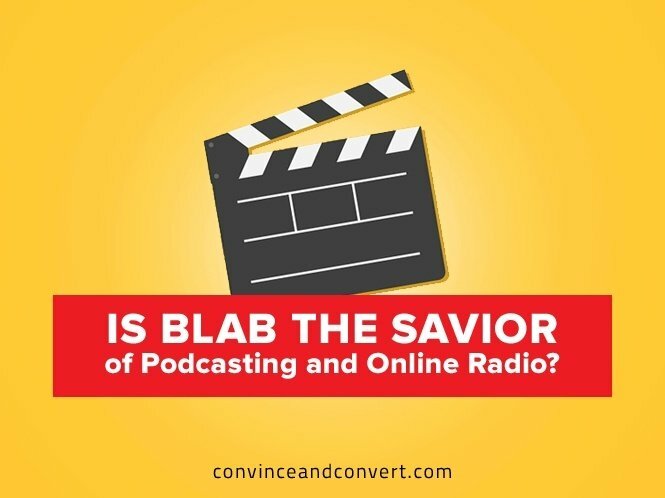 The current darling of the marketing and information products cognoscenti, Blab’s ease-of-use and strangely addicting combination of video conversation and live chat may be just the thing to take podcasting to the next level. It’s a fair question to ask, “If Blab is so similar to Google Hangouts (and it is), why didn’t Google Hangouts move the needle on podcasting in any significant way?” And I think the answer is that Google always gave zero f*cks about podcasting. When you own YouTube, helping take something else to new heights is not only small potatoes, but potentially at odds, strategically. Plus, the conversational element of Blab adds a whole new flavor to podcasting, as interacting with the listening audience is more visceral (and at times, rewarding) in comparison to the lonely, “is this thing on?” nature of typical podcasting. Further, Blab seems to very much understand its potential in the podcasting arena, and recently purchased Podclear, a newish application used by some podcasters to record their shows. (Podclear is sort of a purpose-built competitor to the Skype and GoToMeeting recording function). And, Blab recently hosted its first-ever PodCon, an online confab of podcasting heavyweights talking about best practices in the medium. For Convince & Convert readers, the three most recognizable participating names may have been Chris Brogan, Darren Rowse, and John Lee Dumas. Blab is so easy to use, both for show hosts and for guest/commenters/watchers, that hundreds of podcasts have already either moved to the platform, or been started from scratch on Blab. Podcasting is big, and getting bigger. But it’s still wonky, and a bit lonely. Blab fixes two shortcomings that may hold podcasting back: ease-of-use, and community engagements with fans and listeners. What’s your take? Have you played with Blab? What are your favorite shows? p.s. If you’re into it, there’s a great Facebook group for Blab-obsessed marketers called Blabaholics.